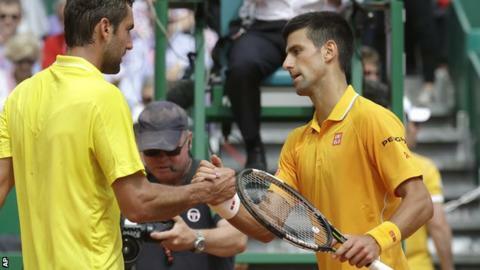 Novak Djokovic will play Rafael Nadal in the semi-finals of the Monte Carlo Masters after both came through contrasting quarter-final matches. World number one Djokovic overwhelmed US Open champion Marin Cilic 6-0 6-3 in 65 minutes, winning the first eight games against the eighth seed. Eight-time Monte Carlo champion Nadal beat David Ferrer 6-4 5-7 6-2 in two hours and 45 minutes. It is the first time he has beaten a top-10 rival since 2014. Nadal seemed to be heading for a straightforward victory only for Ferrer to break the former champion when he was serving for the match at 5-4 in the second set. The intensity of the battle that followed, as Ferrer forced the match into a decider, will have prepared Nadal well for Saturday's encounter against top seed Djokovic, who is bidding to win a third Masters title in a row. After his victory, Djokovic, 27, who has lost only two matches this year, said he was probably playing the best tennis of his career. "All in all it was probably the best match I've played so far in the tournament," said Djokovic, who hit 15 winners and broke Cilic five times in an impressive display. "I like the way I'm playing right now. I'm trying to impose all the variety in the game that I have." Elsewhere, Frenchman Gael Monfils reached his first semi-final in Monte Carlo by beating Grigor Dimitrov, who had knocked out defending champion Stanislas Wawrinka on Thursday. "For sure I'm surprised because this is not a period where I've played my best tennis so far," said the Frenchman after his 6-1 6-3 victory. Monfils, whose previous best in the principality was reaching the third round, will play Czech Tomas Berdych in the semi-finals. Berdych's opponent, Canadian Milos Raonic, retired hurt with a foot injury but the sixth seed was in total control prior to the Canadian's withdrawal, hitting 10 winners and breaking twice to lead 5-2 in the first set.